A Centenary Shared explores public attitudes to the Centenary of the First World War and the commemoration activities that have taken place so far. Are people still interested? What have they learned? And what does the war of 1914-18 mean to Britain in 2016? Building on the baselines established in 2013’s Do mention the war: Will 1914 matter in 2014? and in 2014 after the Centenary commemorations began this report, authored by British Future in partnership with the BBC, Imperial War Museum, Department for Culture, Media and Sport and the Commonwealth War Graves Commission, finds an enduring public appetite for the Centenary and remembering the First World War. 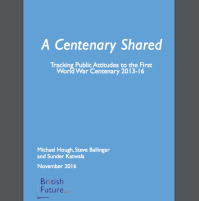 At this halfway point in the Centenary commemorations, the report shows a public that remains engaged with the Centenary, wants to learn more and which feels that the tone of the commemorations so far has been about right. And despite public disagreements in the lead-up to the Centenary about its meaning and how it should be marked, we find that most people can agree on what they feel the Centenary should be about: a chance to learn, to remember and to focus on reconciliation with former enemies.